Please go to this page to choose from all the first grade subtraction worksheets and resources on this site. 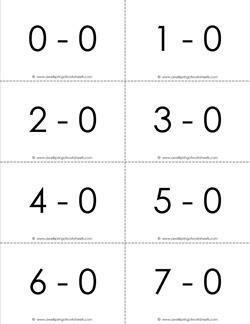 This set of subtraction flash cards includes all the subtraction facts for 0's for numbers 0-20. There are three pages in black and white. 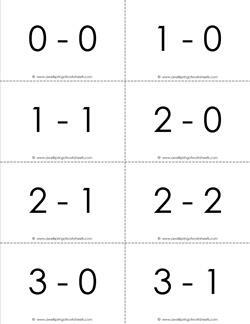 This set of subtraction flash cards includes all the subtraction facts for 0's for numbers 0-20. Three pages in a soft pink. This set of subtraction flash cards includes all the subtraction facts for 1's for numbers 0-20. Three pages in black and white. This set of subtraction flash cards includes all the subtraction facts for 1's for numbers 0-20. Three pages in baby blue. 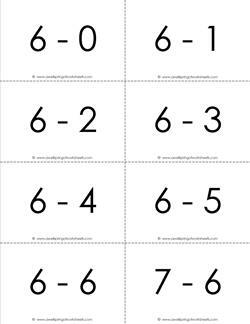 This simple set of subtraction flash cards includes all the subtraction facts for 2's for numbers 0-20. Three pages in black and white. 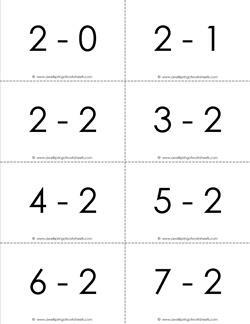 This set of subtraction flash cards includes all the subtraction facts for 2's for numbers 0-20. Three pages in a soft green. 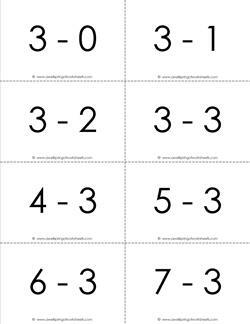 This set of subtraction flash cards includes all the subtraction facts for 3's for numbers 0-20. Three pages in black and white. 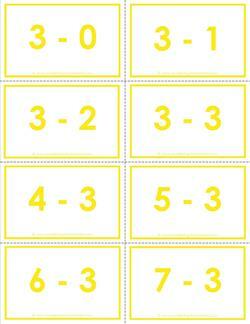 This set of subtraction flash cards includes all the subtraction facts for 3's for numbers 0-20. Three pages in a bright yellow. 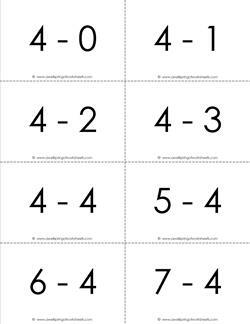 This three page set of subtraction flash cards includes all the subtraction facts for 4's for numbers 0-20. This is the black and white version. 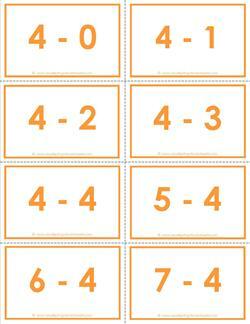 This set of subtraction flash cards includes all the subtraction facts for 4's for numbers 0-20. Three pages in a soft orange. 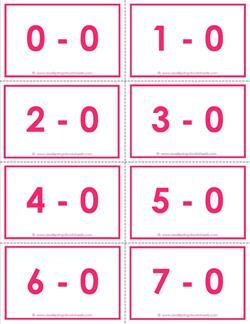 This awesome set of subtraction flash cards includes all the subtraction facts for 5's for numbers 0-20. Three pages in black and white. 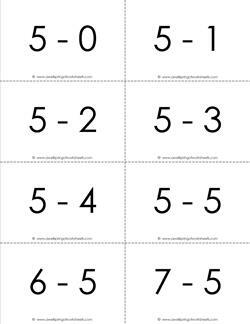 This set of subtraction flash cards includes all the subtraction facts for 5's for numbers 0-20. Three pages in a salmon color. 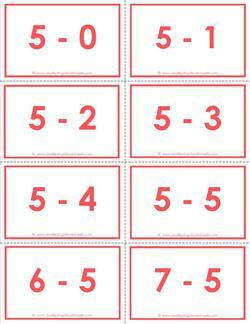 This set of subtraction flash cards includes all the subtraction facts for 6's for numbers 0-20. Three pages in black and white. 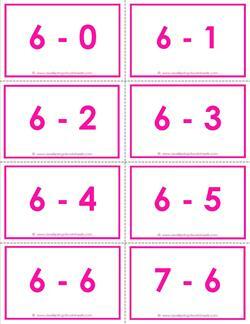 This set of subtraction flash cards includes all the subtraction facts for 6's for numbers 0-20. Three pages in bright pink. 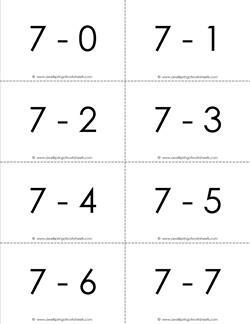 This simple set of subtraction flash cards includes all the subtraction facts for 7's for numbers 0-20. There are three pages in black and white. 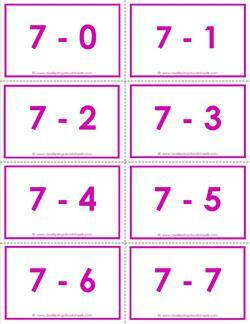 This set of subtraction flash cards includes all the subtraction facts for 7's for numbers 0-20. Three pages in a lilac color. 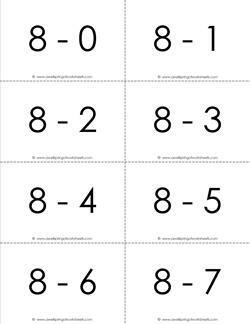 This set of subtraction flash cards includes all the subtraction facts for 8's for numbers 0-20. Three pages in black and white. 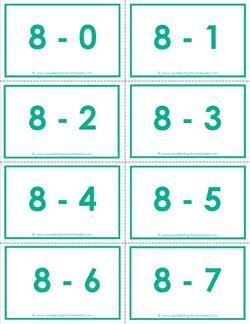 This set of subtraction flash cards includes all the subtraction facts for 8's for numbers 0-20. Three pages in a teal color. 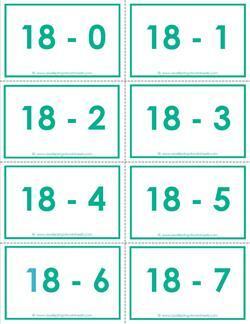 This handy set of subtraction flash cards includes all the subtraction facts for 9's for numbers 0-20. It includes three pages in black and white. This set of subtraction flash cards includes all the subtraction facts for 9's for numbers 0-20. Three pages in a golden yellow. 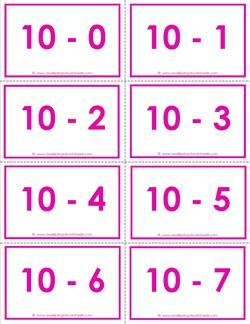 This set of subtraction flash cards includes all the subtraction facts for 10's for numbers 0-20. Three pages in black and white. 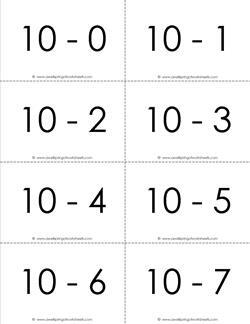 This set of subtraction flash cards includes all the subtraction facts for 10's for numbers 0-20. Three pages in a bright purply pink. 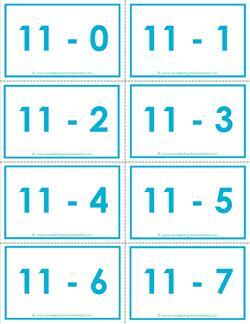 This set of subtraction flash cards includes all the subtraction facts for 11's for numbers 0-20. Three pages in black and white. This set of subtraction flash cards includes all the subtraction facts for 11's for numbers 0-20. Three pages in a light blue. 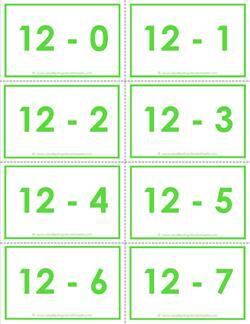 This set of subtraction flash cards includes all the subtraction facts for 12's for numbers 0-20. Three pages in black and white. 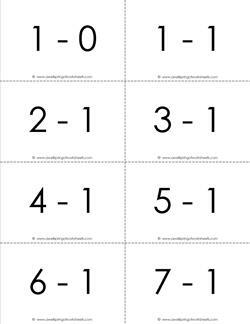 This set of subtraction flash cards includes all the subtraction facts for 12's for numbers 0-20. Three pages in a soft green. 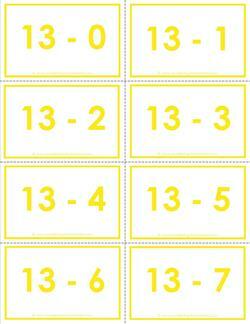 This set of subtraction flash cards includes all the subtraction facts for 13's for numbers 0-20. Three pages in black and white. This set of subtraction flash cards includes all the subtraction facts for 13's for numbers 0-20. Three pages in bright yellow. 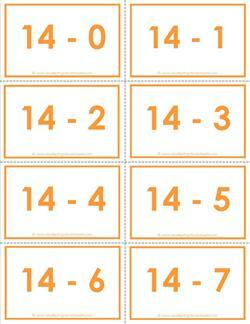 This set of subtraction flash cards includes all the subtraction facts for 14's for numbers 0-20. Three pages in black and white. 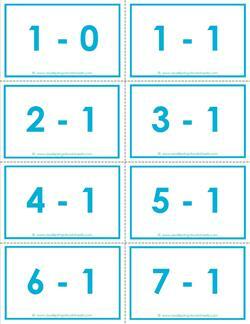 This set of subtraction flash cards includes all the subtraction facts for 14's for numbers 0-20. Three pages in a soft orange. This set of subtraction flash cards includes all the subtraction facts for 15's for numbers 0-20. Three pages in black and white. 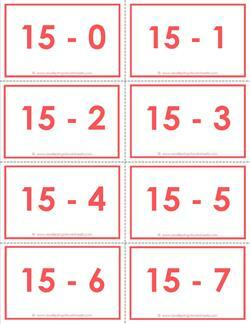 This set of subtraction flash cards includes all the subtraction facts for 15's for numbers 0-20. Three pages in a salmon color. 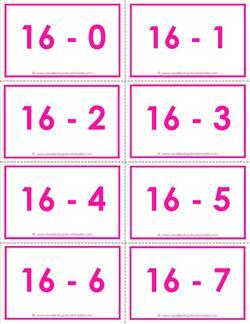 This set of subtraction flash cards includes all the subtraction facts for 16's for numbers 0-20. Three pages in black and white. This set of subtraction flash cards includes all the subtraction facts for 16's for numbers 0-20. Three pages in bright pink. This set of subtraction flash cards includes all the subtraction facts for 17's for numbers 0-20. Three pages in black and white. 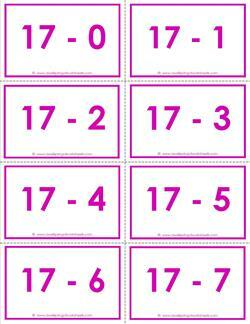 This set of subtraction flash cards includes all the subtraction facts for 17's for numbers 0-20. Three pages in a lilac color. 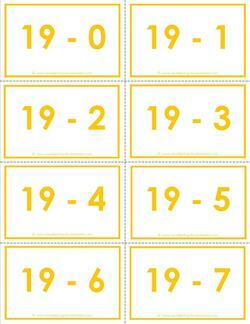 This set of subtraction flash cards includes all the subtraction facts for 18's for numbers 0-20. Three pages in black and white. 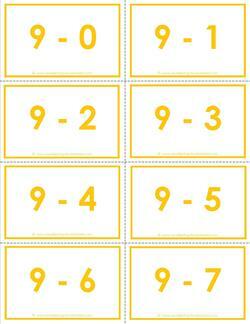 This set of subtraction flash cards includes all the subtraction facts for 18's for numbers 0-20. Three pages in a teal color. This set of subtraction flash cards includes all the subtraction facts for 19's for numbers 0-20. Three pages in black and white. This set of subtraction flash cards includes all the subtraction facts for 19's for numbers 0-20. Three pages in a golden yellow. This set of subtraction flash cards includes all the subtraction facts for 20's for numbers 0-20. Three pages in black and white. This set of subtraction flash cards includes all the subtraction facts for 20's for numbers 0-20. Three pages in a bright purply pink. 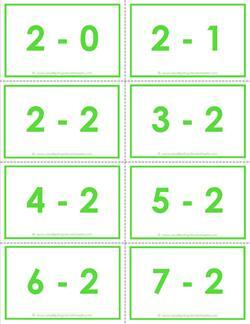 This set of subtraction flash cards includes all the subtraction facts for numbers 0-20. Twenty-nine pages in black and white. This complete set of subtraction flash cards includes all the subtraction facts for numbers 0-20. Twenty-nine pages in purple.